Last summer, Raven Concealment Systems rolled out a new product, a clip for Surefire (and other 1” diameter) tactical flashlights. Of course I bought one. And then torture tested used it in my everyday life. I've been a Raven Concealment fanboy since '07 (before they were used by the Magpul guys, and their order lead time got ridiculous. Their gear isn't unique, but they do make a good product. So when I saw the announcement for the flashlight clip, I figured I'd try it. It has been the best $15 I ever spent, in terms of firearms/accessories. I'm no Tactical Timmy, but I do carry a flashlight with me almost all the time. I use it daily - Checking a cabinet in a truck at work, or finding my cell phone dropped under my car. It's incredibly useful to have a bright flashlight handy. My current flashlight of choice is a Surefire 6PX Pro - good all around light, with decent battery life. I like the Low/High option, rather than the On/Strobe. The low is good enough most of the time, and saves battery life. 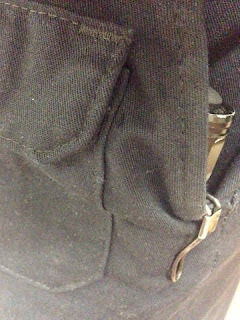 Anyway - Back to the pocket clip. It's seen a little use. 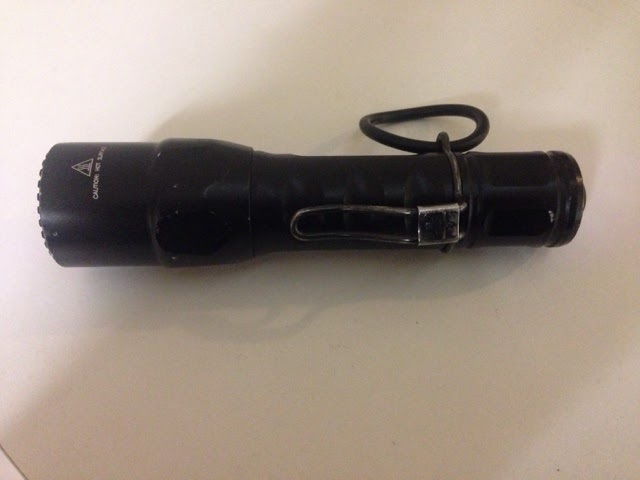 The finish is a little worn, but the flashlight has dings, too. It's held it's shape in all sorts of trousers over the last 9 months, and still works as designed. The clip has two purposes. 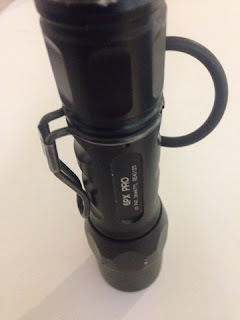 It holds the flashlight in a bezel-down position at the top of the pocket for easy deployment, and it has an O-ring for flashlight manipulation. The idea behind the O-ring is simple - When you grab the light as you would for a Harries stance, you slide your index finger through the O-ring. This allows you to retain the flashlight, and also enables a very cool-looking flip of the flashlight to the back of your hand, to free up your non-dominant hand to reload your firearm or perform other m manipulations. Here's Stephen Pineau demoing the clip - he shows the ring as the first option. 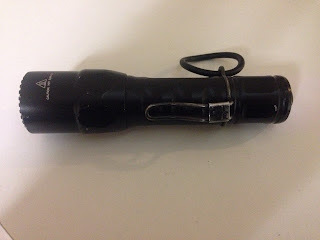 Since I normally use the Harries technique to combine my flashlight with my firearm, this device is just what I needed. If you're scraching your head at the term Harries, here's a link that better explains it. Install is stupidly easy - You unscrew the tailcap, slide the metal clip over the threads and down to the bottom of the barrel at the tail, and then put the tailcap back on. It's quick and easy, and doesn't impact the flashlight use in any way. 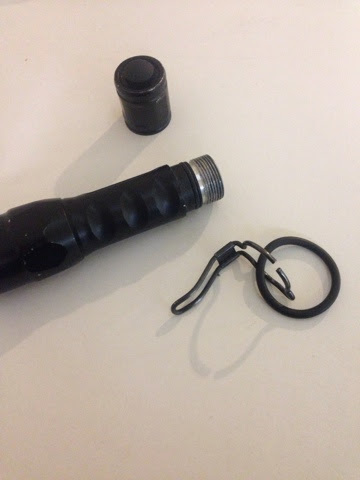 There is usually a small gap between the flashlight and the tail cap, so you aren't adding much, and the threads are long enough to handle it. I wear the flashlight with clip in my left front trouser pocket all the time, either on or off duty. When I'm off duty and laws allow, I have a firearm on my right hip, and I leave the flashlight on my left all the time for consistency. The light rides relatively low in my front pants pocket, and doesn't stick out. I've only found one pair of pants that had trouble holding the flashlight, and that was a pair of Dickies-brand work pants that seem to have pockets that aren't as generous as most pants. In every other pair of pants I've worn, I've never had the flashlight fall out. Anyway - This device, overall, gets an A+ from me. It's inexpensive, and makes carrying a flashlight daily much easier. You don't need to worry about light carriers or having the light fall out of your pocket, or get buried under other items in the pocket. It's a fantastic tool, and something I recommend with no hesitation. If you want to buy the clip - here's the link to RCS's shop.